The severe wildfires in Greece, in which 99 people lost their lives, received much media attention in the summer of 2018. Now that most NGOs have left the scene, we can look back at how Caritas Hellas, who continues to be present in the area, has been helping the families affected by this disaster. A first quarterly report on the activities that have been implemented to help was recently released. Out of the premises of the Pammakaristos Foundation, which has a long history in working with children with autism, Caritas Hellas has built a refuge where the disaster victims could recuperate and get the help they needed. Assisted by many volunteers, its employees have provided psychosocial support to the affected population and distributed meals and other necessary items. 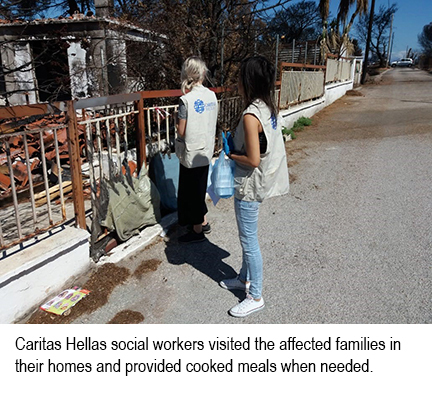 The Caritas Hellas staff, a team of professional social workers, contacted the victims and traumatised people with daily field visits. People could also reach Caritas through a special helpline and help-desk that were established at the beginning of the project. The social workers have been referring some people to trauma specialists of other NGOs. 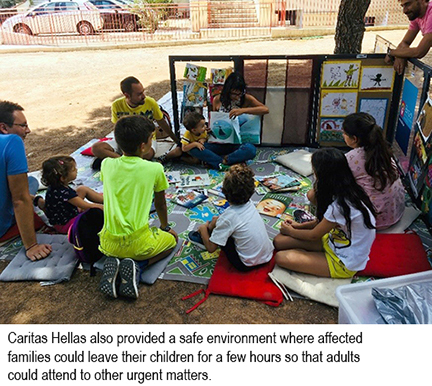 By being close to the victims when they needed it the most and by putting them in contact with specialists, Caritas Hellas helped the affected population to deal with the psychological consequences of the emergency. Additionally, Caritas Hellas prepared warm meals that were distributed to families in the municipality of Marathon, in coordination with local authorities. In three months, Caritas Hellas has delivered approximately 4,375 meals. 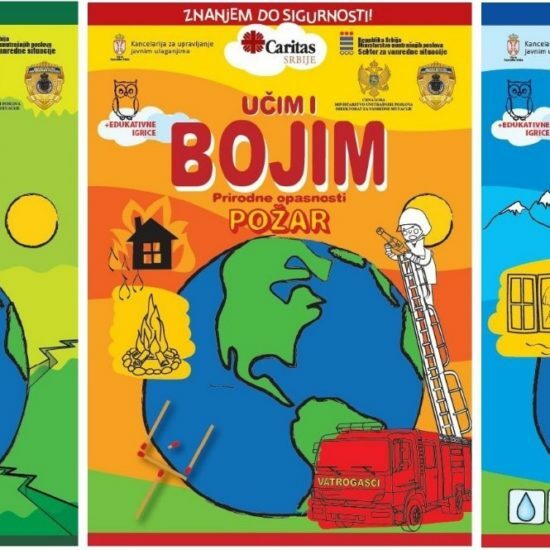 The needs assessment organised right after the end of the fires also revealed other needs, which were covered by the distribution of specific non-food items, such as school supplies for children, mobile devices, clothes, domestic (linen, etc.) and hygiene items, along with a considerable amount of household cleaning products. The goal was to assist the population in their transition and the re-establishment of their daily activities after the disaster. In August, September and October, Caritas Hellas has provided assistance to between 100 and 250 people per day in the region of Attica. The donating Caritas recently agreed to extend the project period, without any additional costs, until the end of April 2019. Among the people who found support in the warm space of Caritas Hellas, was a low-income pensioner, Mrs Eleni. Mrs Eleni suffered the tragic loss of her daughter and grandchild in the fires. Both her house and her daughter’s were destroyed. She often visits the Caritas Hellas Social Service to receive material support, but mainly to talk to Maria, one of the social workers with a degree in psychology. Every day, the volunteers deliver food to Mr Yorgos, a 70-year-old wildfire victim whose small house was destroyed in the fire. Mr Yorgos has no family and no support mechanism. He lives on an invalidity pension of only 345 euros per month. 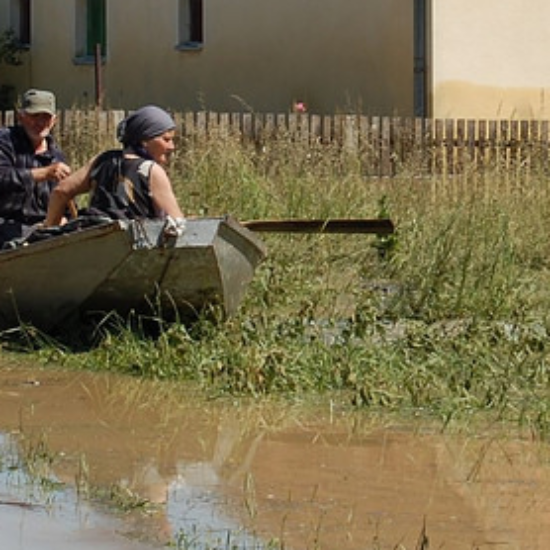 He has rented a very small apartment for 150 euros but with the arrival of winter his poorly maintained place started to take water. The social workers of Caritas Hellas intervened and helped Mr Yorgos to find a temporary bed in a shelter for the elderly run by the Catholic Church. Mr Yorgos will also receive some funds through a parallel project of Caritas Hellas. Now he hopes to be able to rent a warm and clean place soon. One of the most tragic stories, however, is that of the ex-cancer patient Mrs Katerina, a 45-year-old mother of two, with a partial invalidity. Mrs Katerina is unemployed, and her husband is a low-income employee. One of her children is affected by autism spectrum disorders and the expenses for his care are more than the family can afford. The family’s entire possessions were lost in the wildfires. Caritas Hellas staff and volunteers provided food to the family during their stay in the municipal shelter in summer and provided new electric appliances, linen and other material support when the family rented a new home. Unfortunately, Mrs Katerina’s cancer stroke back. She had to be operated again and her husband had to take care of the two children. Caritas Hellas Social Service intervened anew to make sure a volunteering organization for cancer patients could help her in this difficult moment, hoping that soon she will be back with her family.